Penzance is not known as a tourist destination in comparison to the likes of St Ives or Padstow or Newquay, mainly because it does not have the wonderful sandy beaches in those locations. It is more of a working town, a little gritty in places and too many charity shops. It does however have the only promenade in Cornwall and a lovely art deco Lido which is currently closed for a geothermal project to heat a section of the pool and redevelop the top terrace, due to open in the summer. The town also has some lovely Georgian housing mainly close to the Morrab Gardens and Penlee Park. Last Friday saw us do an emergency dash to a dentist (not me) and so I had an hour to take a wander around Penlee Park which houses the Penlee House art gallery and museum (above) along with the Orangery café, an open air theatre, a children’s play area, sensory garden, Victorian pond, Memorial Garden, and the courts for the Penzance tennis club all set in wooded parkland. 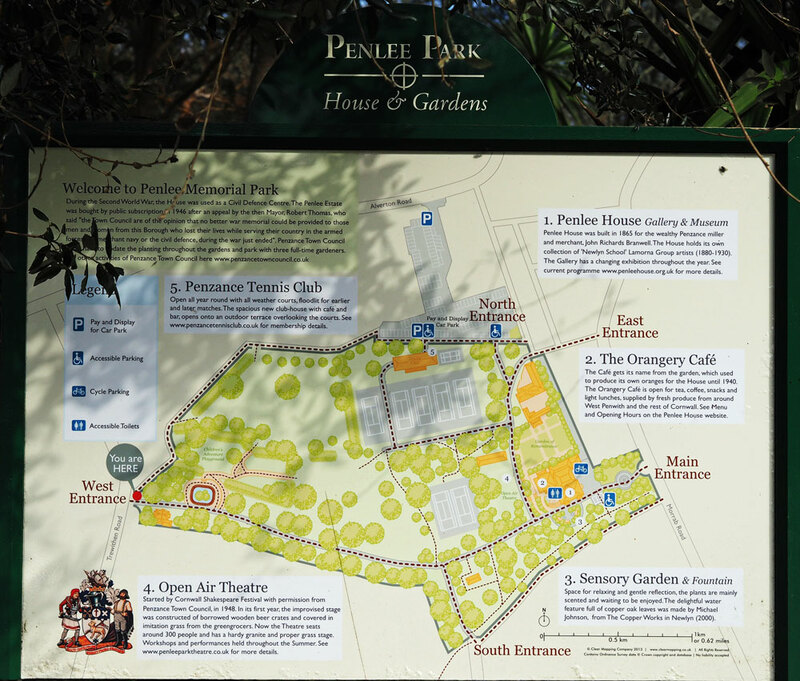 The parkland surrounding Penlee House was initially planted by J.R. Branwell who died in 1902 and included many rare species from all around the world. I have visited the Penlee Memorial Garden before and that was my first stop. No-one else was in the garden so I had a lovely half an hour quietly walking around photographing the flowers and listening to the birds. There are several benches where one can rest and take in the solitude of the garden. 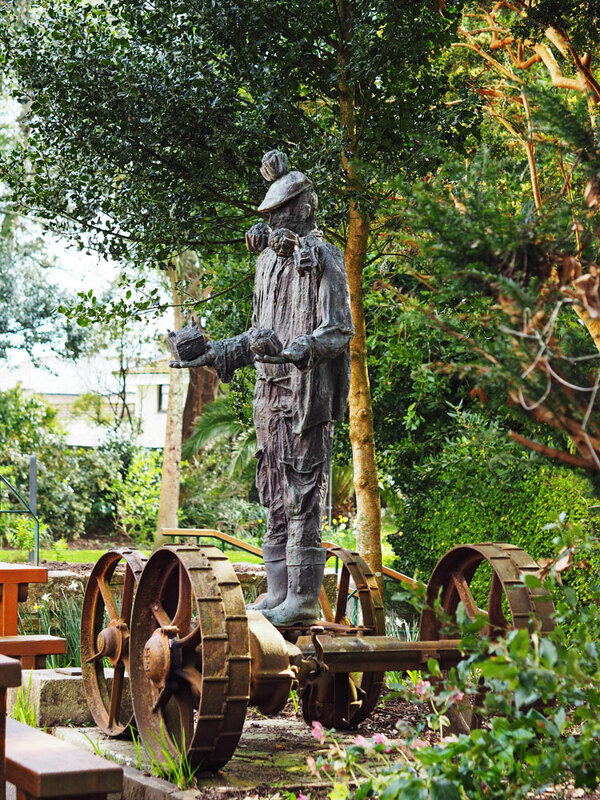 Heading out towards the café you find an unusual sculpture of the ‘The Broccoli Juggler’ by Kurt Jackson, 2015. Close by is the Sensory Garden which is a space to relax and enjoy gentle reflection with the plants being mostly scented. The lovely water feature is filled with copper oak leaves and made by Michael Johnson at the Copper Works in Newlyn in 2000. The park itself does not have many flowers but it makes for a nice circular stroll around the grounds. Rhododendrons are most distinctive at this time of the year and typical woodland plants can be found such as Vinca (Periwinkle), Pieris and Arum lilies. Finished at the Orangery café for a Flat White coffee. Sadly no cake though there were several tempting offerings, but we are on a sugar free diet at the moment so cake is not allowed. Not at the same time I hope! Thanks for sharing your walk, Jude – and what an intriguing sculpture! I have never been keen on the sculpture, but now that I understand it I like it a bit more.